If we finish early enough, we may drive around to Signal Hill National Historic Site, or just potter around St Johns. NOTE TO SELF: The other possibility for the late afternoon is to book a photography tutorial. Look into the timing and cost. What will we do if the weather is appalling? In this case, we'll spend more time in the indoors part of these attractions and see one or two of St Johns museums, for instance, The Rooms, which has art and history. An important issue which we mustn't forget about. Breakfast is included with the accommodation. For lunch, we need to pick up a picnic at the supermarket on our way out of town. I've noted the location of the most convenient one on Google Maps. For dinner, I feel inclined to try something a bit fancy. After all, it's nearly the end of the trip, and we'll have done a lot of picnics and basic cafe food. NOTE TO SELF: Research fancy restaurants in St Johns and consider booking in advance. The Avalon Peninsula is that little bit of Newfoundland that projects out of its south-eastern corner, almost forming an island. You could argue that the Avalon Peninsula itself is formed of four lobes, each of which is just about the right size to visit in a day. However, we have two and half days. Actually, this part of the trip isn't so complicated to plan. We just have three short driving routes with a range of things we could do along them. We won't be able to do them all, but we'll pick and choose at the time, depending on the weather, which can be rather unpredictable in Newfoundland. This loop has 4 hours of driving for 300 km of distance. 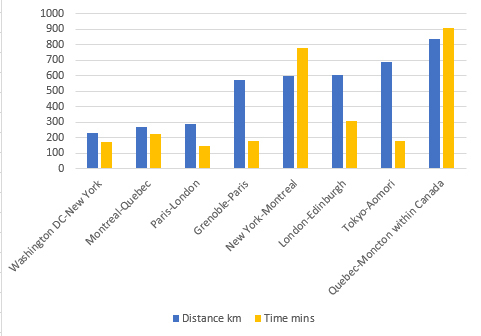 Although it might not seem the most efficient way to cover the distance, that stretch of road we drive twice only takes 15 minutes. Doing things this way round allows us to be in the right place at the right time. The ferry arrives at Argentia at approximately 9.30, but disembarkation could take some time. I'm going to assume that we might be on the road by 10.30. Spectacle Head Trail: in Cupids, it's more of a short climb to a viewpoint than a trail. There are many attractions in the area, either paying or free, indoors or otherwise. Madrock Cafe, purveyors of toutons, a Newfoundland specialty which surely can't be good for us. Bay Roberts Cable Building. There is an art gallery and a museum of local history inside, open 12.30 -17.00, free. Worth driving past for a quick look to compare with the cable station at Heart's Content? Stop for a quick look at the Spirit of Harbour Grace / Amelia Earhart statue and the SS Kyle. It takes about 1 hour to get from Brigus and Cupids to Heart's Content, not allowing for any stops. We should aim to arrive by 15.30. Heart's Content Cable Station - where the first permanent telegraph cable connecting Europe and North America was hauled ashore. Open 9.30 - 17.00. Entrance fee: $6.00 each. 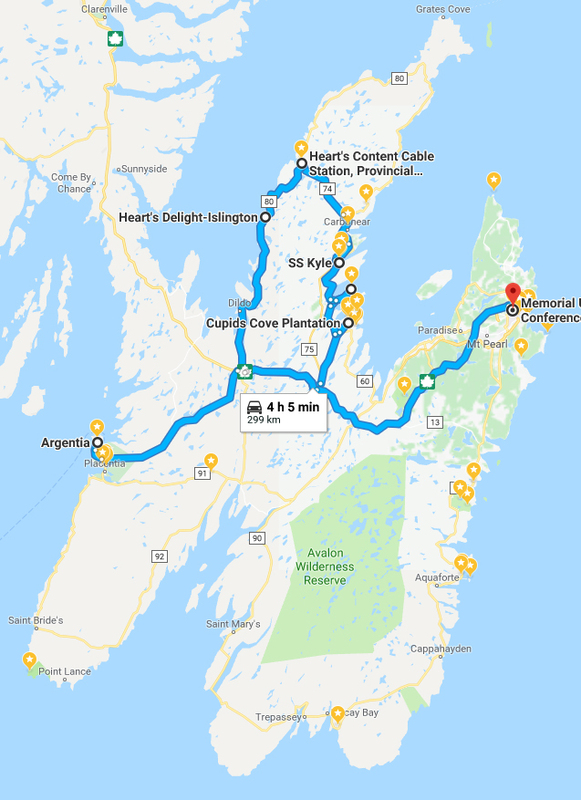 The scenic route along the coast from Heart's Content takes 1 hour and 45 minutes, which is only 15 minutes slower than the fastest route to St Johns and may allow for some photo stops. We're staying on the university campus. There should be laundry facilities, which we may be wanting to take advantage of by this point. NOTE TO SELF: email and ask if I can swap the twin room for a double room, since booking.com didn't offer this option. For dinner, there is a pub on campus if we're very tired, or we can drive 10 minutes to the town center, where there are many restaurants and pubs, ranging from really fancy to pizza. In which case, here is a helpful guide to downtown parking. St Johns Haunted Hikes offers an evening tour of St Johns (Thursday only, as far as we're concerned), complete with ghost stories of course, beginning at 21.30 at the Cathedral for $10 each. The walk lasts about 1 hour 15 mins. Heathrow Terminal 5: in which I say nice things about an airport!!! This isn't about travel planning at all, it's about my little trip to Heathrow Terminal 5 yesterday. I really went to have brunch with Mike as he was passing through on his way between Texas and France, but while I was there I did some photo-sketching experiments with my iPad. we’re not all about tea and crumpets - well some of us are. From Wikipedia: Ingonish Beach. BTW, the author of this photo, Tango7174, has contributed many professional quality photographs to Wikipedia. Thanks, Tango. Sometimes, it's the days that allow no room for maneuver that are the hardest to plan. Wednesday 1 August has to be planned backwards from the time when we need to check in for the overnight ferry at North Sydney. I always find that sort of thing a bit stressful: what if there's an unexpected traffic jam? 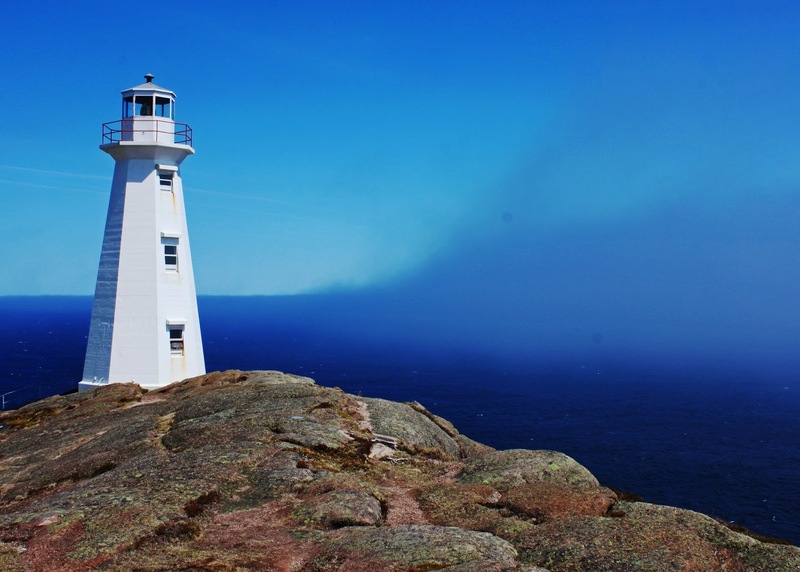 The other difficulty is to decide what to do with half a day in an area that contains Cape Breton National Park and the Cabot Trail. There's easily enough to do here for two weeks. Fortunately, we are staying just on the other side of Cape Smokey from Ingonish, so we get to see what I suspect are two of the prettiest sights of the area. Briefly. 7.00 - 8.00 - Breakfast at the Dancing Moose Cafe. It's not included, but they specialize in dutch pancakes, both sweet and savory. That's obviously unmissable. 8.00 - 8.30 - Drive from accommodation to Ingonish Visitor Centre: allow 30 mins, 27 km, over one of the more spectacular points of the Cabot Trail. Both these hikes look nice, and I suspect that in practice the choice will be made for us, based on our efficiency in getting out in the morning. 8.45 - 11.45 - Franey Trail is a 7.4 km loop hike, climbing up away from the coast to offer views panoramic views back down from the top. It is supposed to take 2 - 3 hours, and would only be possible if we got a really early start. The trail head for Franey is only 10 minutes from the visitor center, but does involve driving for 1 km down a dirt road. 9.45 - 11.45 - Middle Head Trail is a very nice looking 4.8 km loop with extension along a promontory between two bays. It is supposed to take 1.5 to 2 hours. 12.00 - 13.10 - picnic between Freshwater Lake and Ingonish Beach. The trails themselves could take as much as 1 hour to walk, but if we park in the Ingonish Beach day use parking lot, we can have a quick look at both environments. NOTE TO SELF: The picnic lunch will have been bought the day before, but it doesn't need to be too 'prepared'. We can put something together out of the cooler bag on the fly. What will we do if the weather is absolutely terrible? Probably just drive the Cabot Trail north as far as we feel safe in doing with our schedule, taking short stops from time to time and making sure to be back at Ingonish by 13.00. 13.10 - 15.00 - Drive from Ingonish to North Sydney Ferry Terminal, where it's ESSENTIAL to be checked in more than two hours before the ferry's departure: allow 1 hour 40 mins drive, 115 km. I've allowed a very small amount of extra time to pick up our bags from the accommodation if necessary. NOTE TO SELF: Double check these driving times when we do this route the day before, and try to find out about traffic/potential holdups at different times of day. 15.30 - 16.00 - Boarding of the overnight ferry will begin. Our luggage needs to be packed such that we can easily take everything we need for the crossing, as passengers are not allowed to return to the car decks during a sailing. 17.30 - The ferry sails. 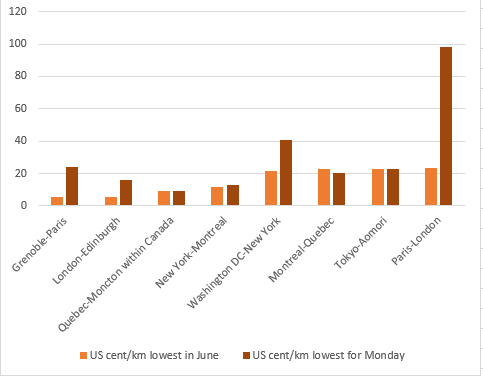 NOTE TO SELF: I still need to reserve the overnight ferries when booking opens for these dates. Note that although they ask for the license plate of the vehicle when they book, drivers of rental cars are only required to provide the license plate number on check in. Opinions vary on the ferry's food offerings, but I'm quite prepared to believe that it will be on the overpriced and average side. I still don't see a reasonable option other than buying some kind of hot meal from them for dinner - especially as by this time, we'll have been picnicing a lot. NOTE TO SELF: What we could do is take some snacks and drinks on board, so that we can arrange our own aperitif, dessert and possibly breakfast - at least the food part of it. It is said the coffee is terrible, but there is not much to be done about it, unless, by chance, the tea is any better. From Wikipeda: Main Street from the reconstructed part of Louisbourg Fortress. Louisbourg Fortress looks to be Nova Scotia's prime attraction: the recommendation is to allow between 4 hours and several days to experience it. It is the site of an 18th-century French fortified town and commercial port, one quarter of which has been reconstructed. Also around Louisbourg is a particularly pretty lighthouse on some nice coastline. We're just going to get there as soon as we can, and leave around closing time, which is at 17.00. I don't have to do too much planning for this, as the site itself provides you with everything you need. We will probably take a guided tour (hopefully in French), look around a bit on our own, then start on the local walking trails. We will get lunch on the site, but I'm leaving it open whether we go for the amusing, but possibly gimmicky 18th-century tavern option, or the more modern sandwich shop. I do think the tavern's pain perdu could be worth a try. 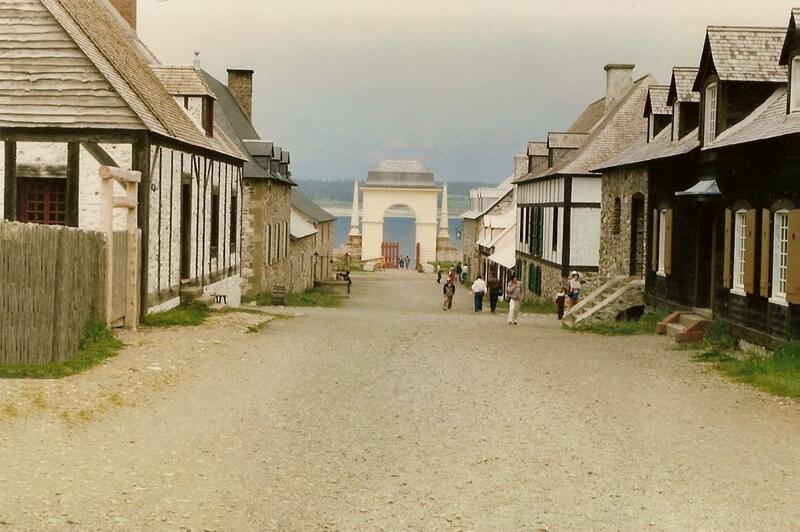 8.30 - 10.45 - Drive from the hotel to the Fortress of Louisbourg: allow 2 hours 15 minutes, 170 km. I think our best move is to get this over with as quickly as possible, but if we leave early enough, we can make a short stop at St Peter's Canal National Historic Site which is free, and opens at 8.00. 10.45 - Arrive at Louisbourg Fortress National Historic Site. The entrance fee is $17.60 each, opening hours are 9.30 to 17.00. After that, we see everything at the fortress, have lunch, take some local walks, and generally take full advantage of the place. Some of the trails, such as the Ruins Walk, are inside the park, but others, such as the Lighthouse Trail are across the harbor. Depending on time/weather we might do this before or after the fortress, BUT note that there is a 20 minute drive between them. 17.00 - 17.50 - Drive to the supermarkets outside North Sydney, as we need to stock up on some food: allow 50 mins, 61 km. 17.50 - 18.50 - Allow one hour for shopping. You never know, it might take that long!! 18.50 - 20.00 - Drive from the supermarkets to the accommodation: allow 1 hour, 10 mins, 87 km. We might detour via the Englishtown Ferry, but this doesn't make a whole lot of difference to the time, though it knocks 20 km off the drive. 20.00 - Arrive at the 'tents'. I was drawn to these because I somehow imagine that the night will be crystal clear, and that I'll get in some star-gazing (before the moon comes up 22.47) while enjoying a romantic picnic supper on the beach. We'll see what the weather has to say about that plan. There do not appear to be any cooking facilities at this place, which is a tiny downside, and means that the picnic supper will have to be cold. At any rate, these wooden 'tents' are very inexpensive, if rather basic. NOTE TO SELF: I still have to do some fiddling with this reservation. I need to cancel one day, which is a shame, and I need to ask them to give us a bed linen package, since this is not their standard option. Obviously, this is another very long day. If it turns out that we leave Louisbourg a little earlier, and don't spend too long in the supermarkets, so much the better.